Hope y'all are doing mighty fine today? Today, I've got my swatches and review of the 2nd half of Zoya Summer 2012 Collection titled the Surf Collection. 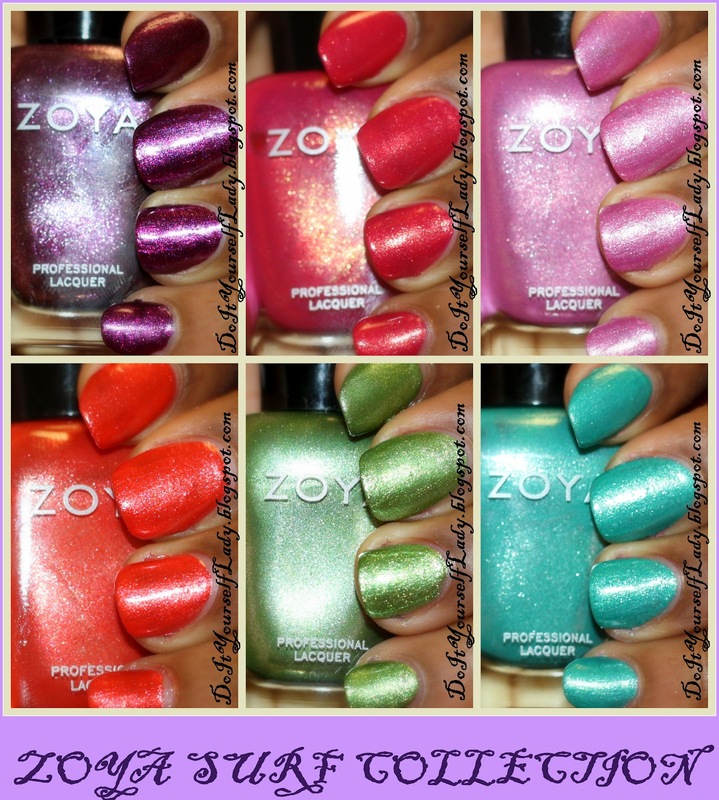 This collection consists of 6 Colorful polishes that have a gorgeous metallic finish to them. Each polish makes me excited that summer is right around the corner and they have so much shimmer to make an Ice princess jealous. Lol... Look at what I mean.. So much summery goodness! For complete swatches and my review of each polish, click read more below. Swatches are in the order they came from the box. All swatches are 2 coats except stated otherwise. I used a base coat for all, but no topcoat because I wanted to show you each polish in its own glory without topcoat. We already know top coat adds additional shine and smooths out polishes. So no need to show you that. Lol.. Remember you can click on pictures to enlarge them. First up we have Carly. If you read my blog regularly, or if you look around right now, you'll know that I am a big fan of purple. Carly is a pretty purple polish that was opaque in one coat! Yes what you see below is just one coat without topcoat! Due to it's opacity, Carly is a very good polish to use for stamping. I test-stamped with it, and was really impressed. Carly looks like Zoya - Jem's twin sister, but believe me when I say, these two are definitely fraternal twins. Lol.. No dupes here. Next up, is Kimber. Kimber is a pink polish that leans red in some lights. Application was a breeze. The day I got this polish, I immediately used it for a pedi and mani! I couldn't wait till it's officially summer to wear this one. Colors like this work well with my skin tone, so I'm happy with this polish. Here we have Rory. She's the "baby" of the collection to me. lol.. Such a pretty baby pink that packs a punch of shimmer. Nothing much to say about Rory. She's a welcomed color in my stash. For one of those days when I feel like wearing a light pink. Next is Myrtaa. She's a pretty orange polish in the bottle, but on the nail... I have mixed feelings. Myrta is the odd one out formula-wise for me. She's also the hardest to photograph in this collection. I almost gave up trying to get a decent picture. This is the only one I used topcoat with. What you see is three coats of Myrta with topcoat. The polish is gritty and rough looking despite all my attempts at trying to even it out. She's pretty and summery, but as you can see in the pictures... I ended up with tiny bumps and I couldn't figure out why. :-( And no, I don't think it's cos of all the layering because I kept layering to take off the bumps I had at two coats. Next is Meg! Oh darling Meg! She's feisty and so frosty! If frost is your thing, this is the polish for you. So much shimmer! Meg surprised me application-wise because I was expecting her to be a streaky mess. Thankfully, she wasn't! And this made me like her! I don't think I have a color like this yet, so I'm happy about owning this one. Application was nice. Such a pretty color! From now on, when I review "collections" as a whole, I will try to relate with non-polishaholics out there who wear their polishes for more than 2-3 days. I chose Kimber for my "how long will it last" polish. How long will it last is what I have decided to do with at least one polish that comes in a collection. I wore Kimber for 4 days. Yes 4 days was long for me, but I was busy anyway, and decided not to think about it. lol... I used a base coat and topcoat for my how long will it last mani. The result: On day 4 I had tip wear on most of my nails, but only two nails were slightly chipped. Forgive me for not having a day 4 picture. I'll remember this for other How long will it last posts. I didn't think before I took off the polish. This brings me to another part of this review. As with all metallic polishes, cleaning/removal of these polishes can be a chore if one is not careful. The shimmers can get all over the place, and you could end up using up all your polish remover. Lol.. Read my Tips/Tutorial page for a very EASY way to remove shimmery or glitter polishes. Alright my Loves! I hope you've stayed with me up till this point. But please, do tell me, do you like my "extensive reviews", or would you rather just look at pictures and keep it moving? I'll strongly consider your suggestions/opinions, so please share with me. Are there any Polishes from this collection that you want or already own? I really like all of them and my favorites are Carly, Kimber and Zuza! My least favorite is Myrta but that might change once I figure out how to apply it without bumps. I like that these polishes are not just pretty to wear alone, but they can all be used together as I showed you in the Gradient Manicure I shared with y'all Yesterday. Absolutely have to have Zuza. Glad to hear these wear well. I had issues with one of my Zoyas that chipped fairly quickly, but maybe that was a fluke. She's a gorgeous one Zuza! Nice swatch pics. All the colors look really good on you too! I will be getting all of these! So exited. I like your long reviews personally, so I hope they stick around. Yep. Those are two of mine too. Gorgeous Polishes. omg theyre sooo pretyyyyy i really love kimber and rory! Thanks for your input. I plan on continuing my reviews this way. Glad you enjoy it. I have loved Zuza and Kimber since I have seen them! But Carly - I wasn't too impressed - until I saw your swatch! Such a beauty! !